Remember the songs you were listening to over and over in college? Or that tune that was ruling the airwaves during this warm summer by the beach? Spotify decided they'd help your remind of those old songs from when you were a teen or in your early 20's. 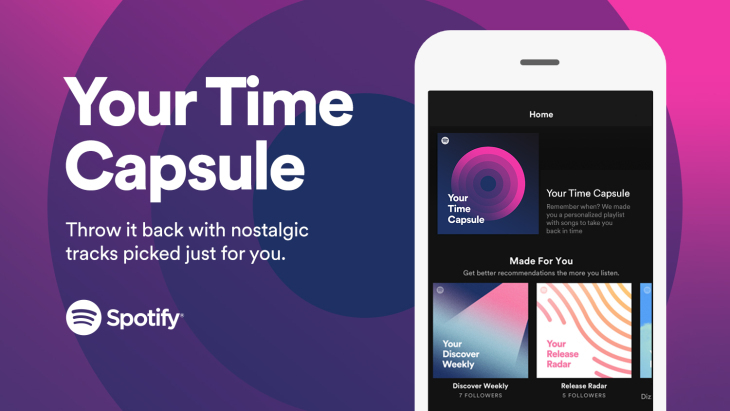 Every Spotify user above 16 and across 60 markets now has a personalised playlist that will take them back in time. Nothing less than 30 iconic songs and throwback memories. 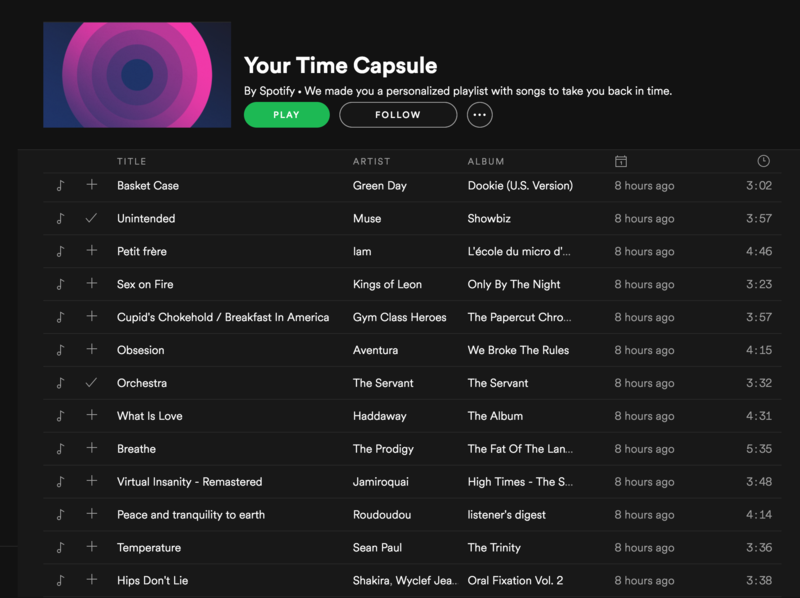 Here's everything you need to know about Your Time Capsule Playlist. 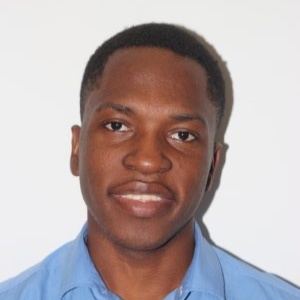 At Kumbu, we're all massive Spotify users (except Diane who switched to another platform), so we could dive in and guess some pieces of the algorithm used to generate the playlists. Your age: songs are selected based on your age. Remember when you kindly provided your birth date when signing up? Your musical preferences: songs are based on what you listen to on Spotify of course. You must be an active user: Diane for instance doesn't have a Time Capsule Playlist because she doesn't use Spotify enough. Your age is a very important information in this matter. Spotify has the data and knows what are the most listened to bands and songs for the last 2 generations, at least. So they basically know for a fact what were the most popular songs when you were a teen. In my case I knew for sure that Wonderwall or Bitter Sweet Symphony would pop up and it did. 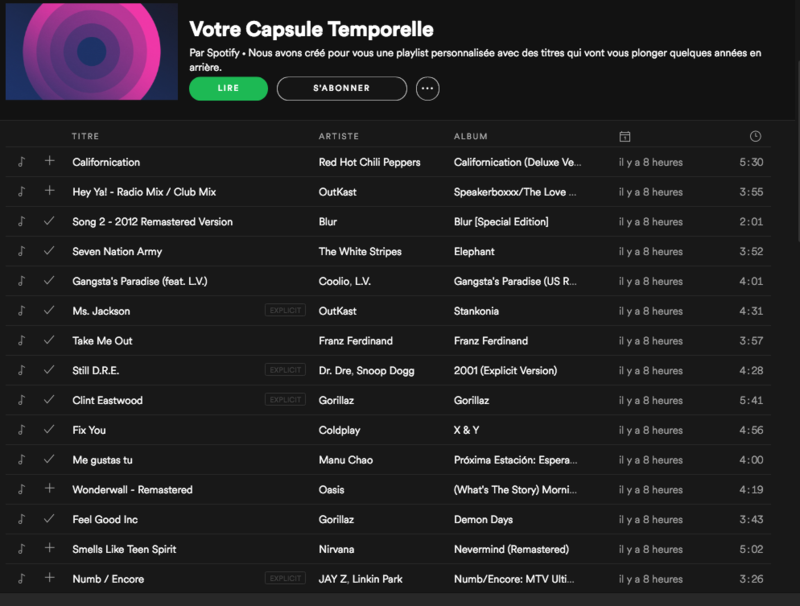 Your musical preferences: then Spotify builds your Time Capsule playlist according to the music genres you listen to. Also, Spotify follows a major principle: do you still listen to music from your adolescence? If the answer is YES, than, a lot of the songs you still listen to will appear in your list, sadly reducing the fun of finding some forgotten gems. If the answer is NO, than Spotify features the Most popular song of the Most popular artist of your generation. 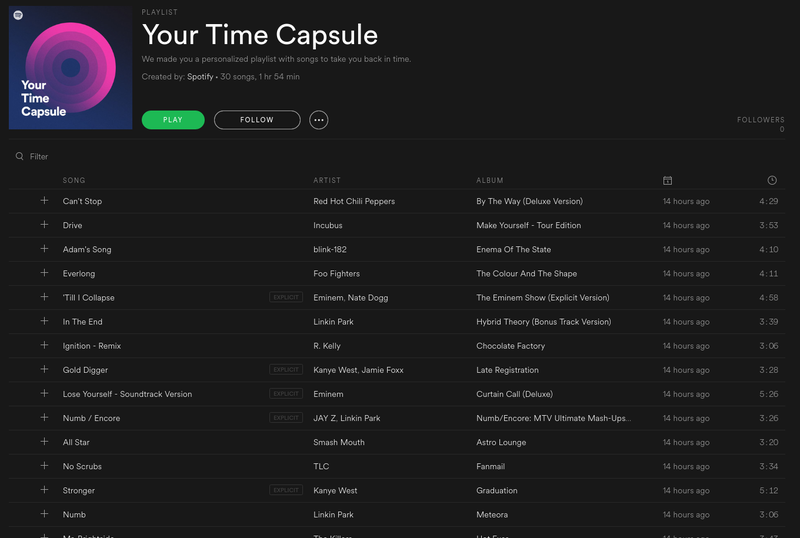 Is the Spotify Time Capsule playlist accurate? Because of how it is generated, it is pretty much accurate. You should know that it isn't meant to be the playlist of your favorite hits, but rather a playlist of highly popular songs when you were young. And it works! We noticed some mistakes though, with bands or songs that were not popular at all. I found in my list James' Brown's Pappa's got a brand new bag. A 1965 tune that no teen would listen to in the early 90's. So why is it featured? Probably because it was feature on the 1991's James Brown Best Of Album. Also our playlist were missing a lot of songs. As usual, Spotify limited the playlist to their magic number of 30 songs (approx 2 hours), so everything could not fit in... but still, they've missed some essential hits. Last but not least, if as a teen you were listening to some niche death metal music that you have completely stopped listening to and ever since tried to forget about, they shouldn't come out in your Time Capsule playlist. How do I know if my Time Capsule Playlist is any good? 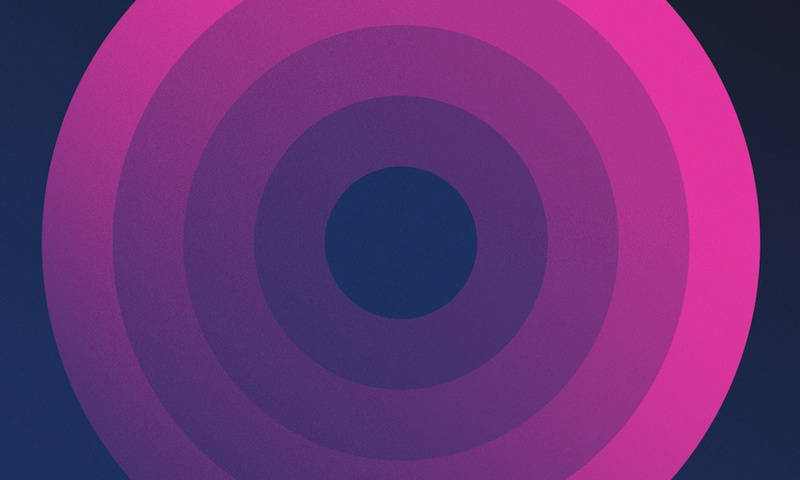 But you should note that your playlist will evolve dynamically through time! 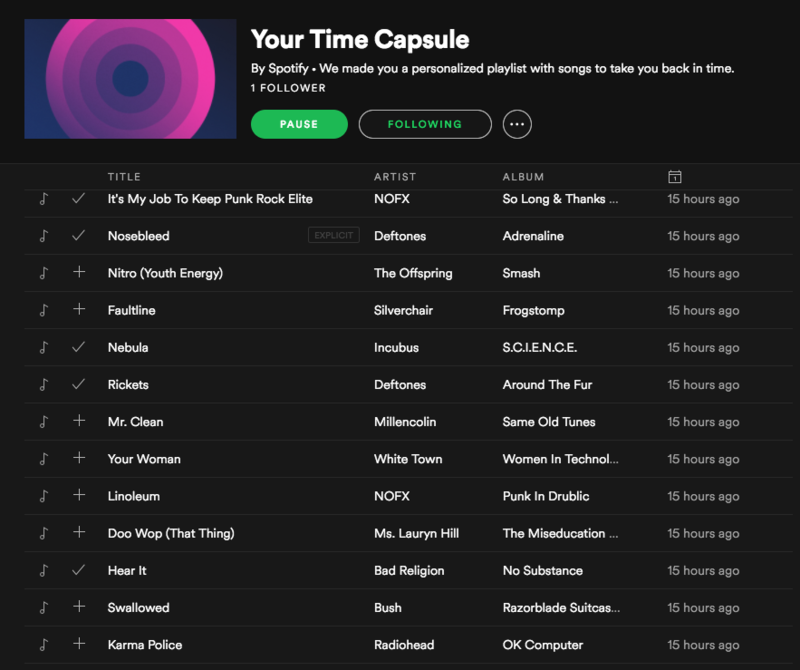 How do I find my Time Capsule Playlist? 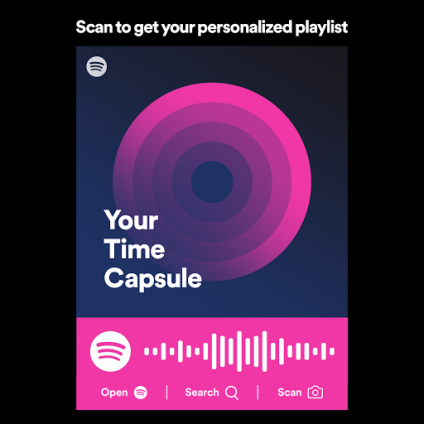 If you haven't seen it surface in your notifications or your Spotify homepage, you will easily find it by typing Time Capsule in the Spotify Search Bar. 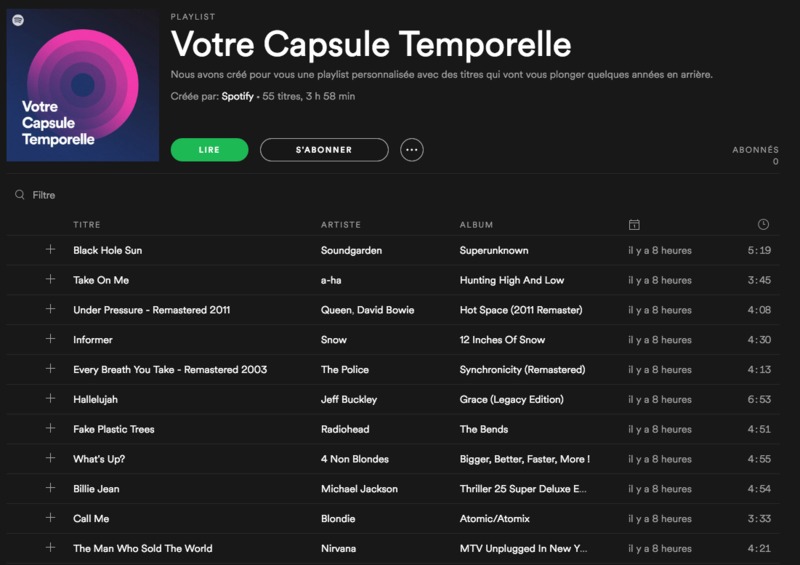 If you're using the browser version of Spotify, you can access your playlist on the Time Capsule website. Or you can simply scan the image below. Make sure you Follow the playlist so you can access it directly from your favorites and see how it evolves.